When you’re ready to take your interest in boating to the next level by purchasing a vessel, it’s important to understand the inner workings of the industry; entry level boat buyers have a lot to learn about this complicated market. This primer is a valuable resource, outlining the variables of boat-buying — things like whether to buy new or used, at a boat show or through an online listing, and how to select a trustworthy broker. The nature of boat-buying is more like buying a house than a car. With so many idiosyncrasies in the industry, you may encounter some unscrupulous behavior. Sellers or brokers may misrepresent issues, disguise damage to the boat, manipulate your emotions into making an impulse purchase, or even sell you a vessel with a maritime lien for which you could be liable. Once you’ve made your purchase, you need to know how to properly store and maintain your new boat. Choosing between a new or previously-owned boat rests on many important factors. You may feel passionately in one direction because of considerations like price, your mechanical know-how, and personal tastes and values. However, you should keep an open mind because there are great opportunities to buy a great new or used boat. The biggest benefit of a new boat is that it comes with a clean slate. You’ll have no misgivings about the integrity of the ship or question if it’s had water damage or was improperly winterized. If your biggest fear is unwanted surprises after making a purchase, a new boat might be the right choice. Additionally, a new boat will be under warranty, protecting you from many issues that may arise after your purchase. If you’re more interested in value, you should focus on the used boat market. There are opportunities to get a great deal on a lightly-used boat; the moment a boat leaves the lot it loses between a quarter to a third of its value. If you have an unlimited budget, this isn’t a major consideration, but others must acknowledge and factor in the cost of depreciation. Most boat buying searches begin online. You may not ultimately make a purchase through an online listing, but you should start your research at sites like Yachtworld or Boat Trader. With the Advanced Search on these sites, you can toggle between variables like new or used boats, boat type, length, manufacturer, and model year. Taking a few precautions before making an appointment to see a boat in-person helps avoid the disappointment of a product that doesn’t live up to the expectations set by its listing. Compare photos and listings of the boat with others of the same boat type. Does the seller avoid certain angles or neglect to talk about features of the boat, while similar posts do? This could be a red-flag that there is an issue the seller is attempting to conceal. Boat shows are a great opportunity to buy your first boat. These conventions gather hundreds of different boats in one place, with manufacturers and dealers marketing their products and offering exclusive deals. These conventions are held in popular boating cities like Fort Lauderdale, FL and allow you to climb aboard and experience more boats than you’d ever be able to otherwise. They’re also designed to be a fun experience, so you’ll be able to enjoy the festivities while looking at a wide range of boats. You’re often able to get a great deal at a boat show. Dealers are incentivized to make sales at the show, so there’s a definite opportunity for deep discounts or free extras. However, don’t let a show-only discount force you into a rash decision; sometimes dealers will honor the deal shortly after the show. Dealers also use the boat show as an opportunity to unload the previous-year’s models, providing the opportunity to get a great discount on what is essentially a new boat. You’ll either work with a boat dealer or boat broker when you buy a new boat. It’s important to understand the distinction between dealers and brokers because they play different roles. A boat dealer buys inventory and represents manufacturers like a car salesperson; a broker represents individual sellers similar to a real estate agent. You can also buy directly from a private seller, which can be advantageous if they’re very motivated to sell for a negotiated cost. Some buyers hire a broker themselves. A broker can help you through the boat search and buying process, help you with paperwork, and find financing options. Whenever you work with a broker, it’s important to perform due diligence on their background, research their reputation, and get references. When you’ve found a boat you’d like to purchase, there are some standard procedures that must be completed before you finish the transaction. First, hire a certified marine surveyor to give the craft a comprehensive inspection. They’ll take the boat out of the water and check its hull, inspect the engines and pumps, and check for any other potential problem areas. It may be a costly procedure, but you should never buy a first boat before a certified surveyor has given it an inspection. You also need to take the boat on a sea trial, which is essentially a test drive. Pay close attention to everyday aspects like the boat’s power, handling, and the overall comfort of the ride. Don’t just sit as the operator of the boat; you should also put yourself in the place of a passenger. Sit in every seat of the boat and take note of the experience – can you smell exhaust, is the ride too bumpy, do you get sprayed with water? After you make a purchase, the next step is finding storage for your new boat. You can either keep it at home on a trailer or pay to keep it docked at a marina. If you favor keeping the boat in the water, research different marinas in your area to find one that is best for your needs. Not all marinas are equal so check to see if amenities like on-hand mechanics, gas pumps, electricity, and even wireless internet are offered. When you visit the marina, talk to the staff and other tenants. Verify how long it takes to get your boat out. Make note of the water conditions – high traffic marinas may have rougher waters, which leads to constant movement that’s bad for your rigging. Some climates require you to remove your boat from the water in the winter. In those locations, properly winterizing your boat is necessary. Failure to properly do so can lead to significant issues later. Some options for winter storage include climate-controlled boat storage areas, shrink-wrapping, or simply taking it out of the water and putting it under a high-quality tarp. As a new boat owner you may want to consult with a professional who can advise on the best winterizing options for your boat. Just like proper storage is required to keep a boat at its best, so is maintenance. Poorly maintained boats experience a variety of issues that get in the way of enjoying your craft. Boat owners should expect to annually spend about 25% of the boat’s value on maintenance. 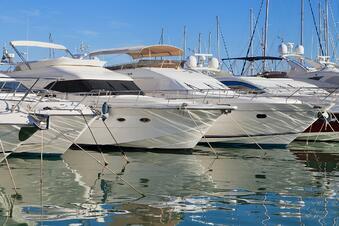 In many areas you may be required to purchase insurance for your boat. Whether it’s required or not, the smart boat owner should always have their property well-insured. You can also work with a marine fabricator to enhance and improve your boat. They may recommend replacing the cheaper stock canvas with more durable materials. Another modification could be upgrading the enclosure curtain to Strataglass vinyl, which provides optimal clarity and performance. Buying your first boat can be an overwhelming experience, but it doesn’t have to be. When you’ve done your homework and have a thorough understanding of the issue, you’ll be able to enjoy the process of searching for your dream boat. When you are confident in the purchase you make and know how to properly take care of your craft, boat ownership can be one of the most rewarding experiences of your life. Download our guide to learn about marine vinyl fabric for your new boat.